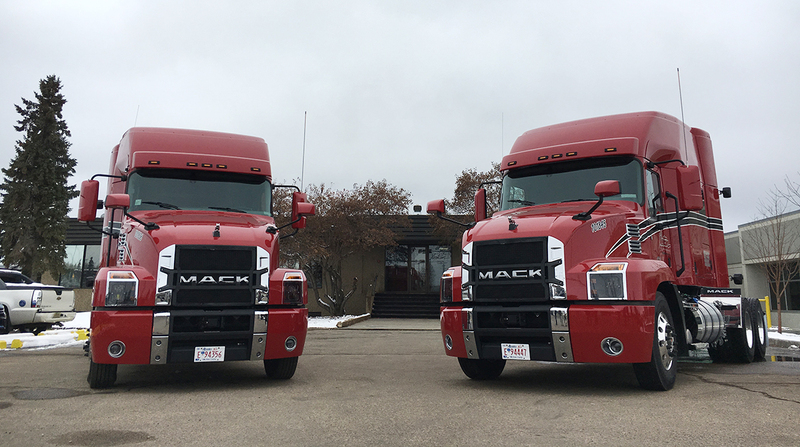 EDMONTON, Alberta — Bolstered by a growing Canadian economy and a strong trucking market overall, Mack Trucks is looking to increase its presence across the northern border. Economic forecasts, including from the International Monetary Fund, show Canada’s GDP will grow about 2% in 2019. Additionally, Canadian exports grew 12.3% in the second quarter — the strongest quarterly gain in four years — and total construction spending there also is the highest it has been since 2014. “When we talk to our customers, when we talk to our fleets, the issue right now isn’t tonnage, it’s not freight, it’s finding capacity and finding drivers to drive the capacity,” Jonathan Randall, senior vice president of North American Sales, said during a media event here Oct. 10. “More often than not, when selling trucks to a customer, if they’re going to order 20, 30 or 40, the off-the-cuff comment is, ‘I’d order another 20 if I could find drivers for them,’” he said. Westcan Bulk Transport, an Edmonton-based company present at the event, operates 16 locations across Canada and serves more than 500 customers in the retail petroleum, oil and gas, mining, agriculture and construction industries. It entered its most recent agreement with Mack in 2009 because of the manufacturer’s engineering support for harsh Canadian conditions. Westcan built a large portion of the ice road that leads to the diamond mines in Canada’s northwestern territories, and it sends trucks to haul fuel and other supplies along that route every February and March. “Mack came to the table with a tractor that truly delivers on the regular feedback we have provided regarding what we want to see in a fleet tractor,” said Mike Royer, vice president of fleet services. Currently, Westcan’s fleet of roughly 700 power units is about 80% Mack, and it has adopted the Mack Anthem as its fleet truck. A key reason why, Royer said, is its available safety features. That includes the Bendix Wingman Fusion, which gathers input from radar, video and the truck’s braking system to help minimize accidents. If the system identifies a large, stationary object in a vehicle’s lane of travel, it will notify the driver up to 3.5 seconds before impact. If the driver does not take action, the Wingman Fusion can automatically engage the brakes. Bendix noted that this can be useful in situations when visibility is reduced, such as snowstorms that are not uncommon in northern Canada. According to Stu Russoli, highway product manager at Mack, among the areas the company targeted when developing the Anthem was driver comfort. This also is an area of importance for Westcan, which is launching a driver recruitment effort aimed at improving the image of trucking. Last month the company debuted the video “You’re Meant for the Road” in an effort to improve recruitment and retention. The campaign seeks to replace a stereotype of the truck driver as disconnected, with an image positioning Westcan drivers as a group of elite, trustworthy and skilled role models. The need is real; a study commissioned by the Canadian Trucking Alliance predicts a shortage of as many as 48,000 drivers in the country by 2024.